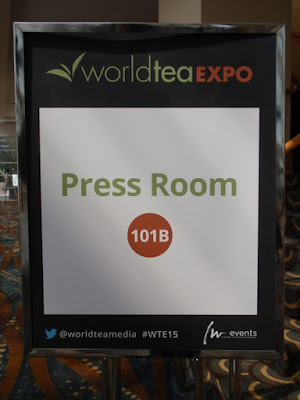 May 6th was a Day of Firsts, being my first visit to Long Beach, California, my first attendance at the World Tea Expo, and my first time attending an event as Press. 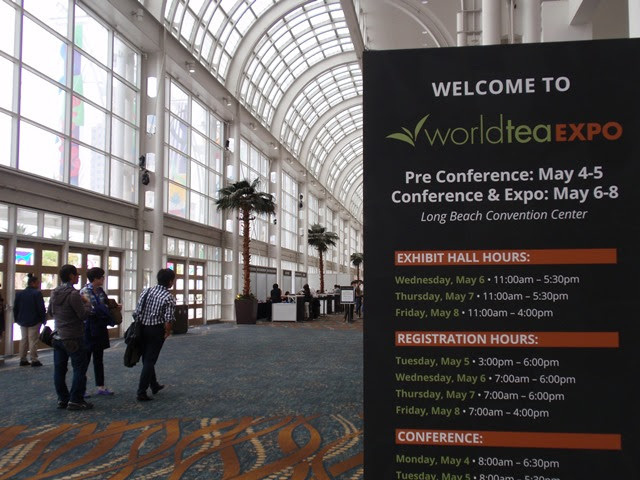 My early flight and hotel check-in went smoothly and I arrived at Long Beach Convention Center just in time for the Exhibition Hall opening. A quick check-in at the Press Room, a moment to update my schedule with newly listed events, and I was on my way! 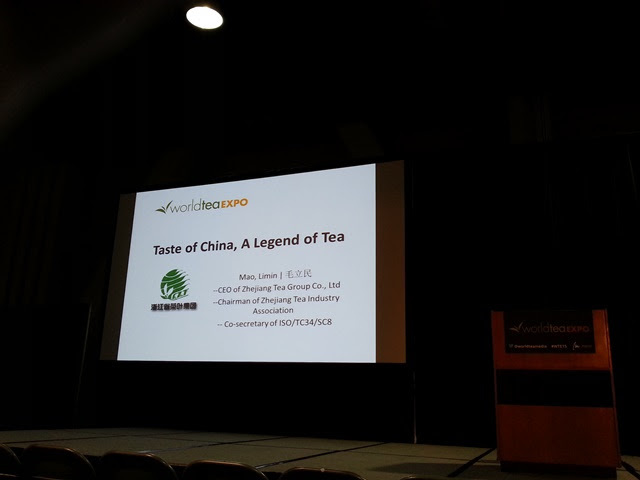 The special events kicked off with Taste of China, A Legend of Tea presented Limin Mao of Zhejiang Tea Group. 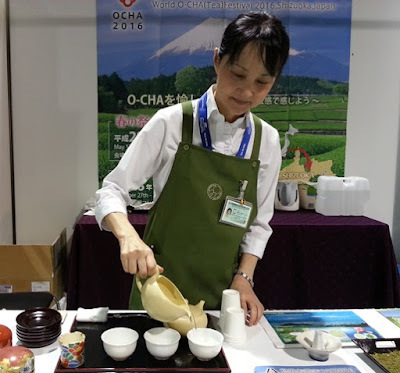 The presentation covered the history and significance of tea in China, including a demonstration of gongfu tea preparation and historic preparation method for Chinese powdered tea (predecessor to Japanese matcha). I attended the Amplifying Your Business Voice Through Tea Bloggers panel featuring Nicole Martin (Tea for Me Please), Geoffrey Norman (Steep Stories of the Lazy Literatus), Jo Johnson (Scandalous Tea), and Jen Piccotti (An International Tea Moment). 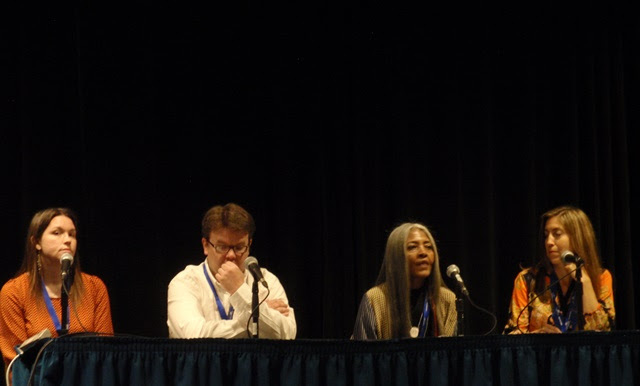 The focus of the panel was to provide businesses with tips and best practices for communicating with tea bloggers to get their teas reviewed and publicized. 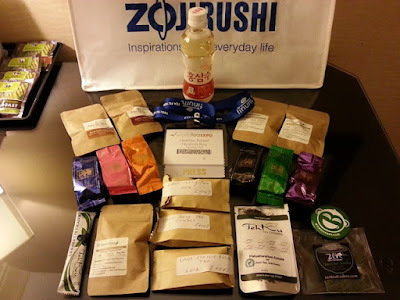 Per the discussion and in my own experience, it takes on average, up to 27 days to review a tea. 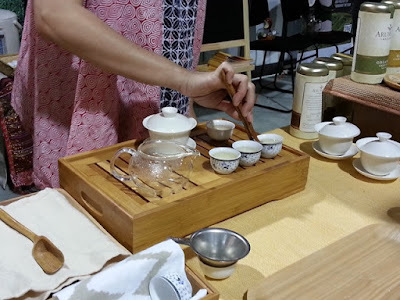 Generosity is wonderful, but businesses should consider providing only small samples because tea bloggers usually have a surplus of tea. There is simply not enough time to drink through large samples before their expiration. Proper packaging with information on recommended preparation methods and notes stating whether the tea must be consumed before it loses strength are also highly encouraged. My plan for the remainder of the day was to visit as many vendors as possible, see what's trending, and discover new teas. 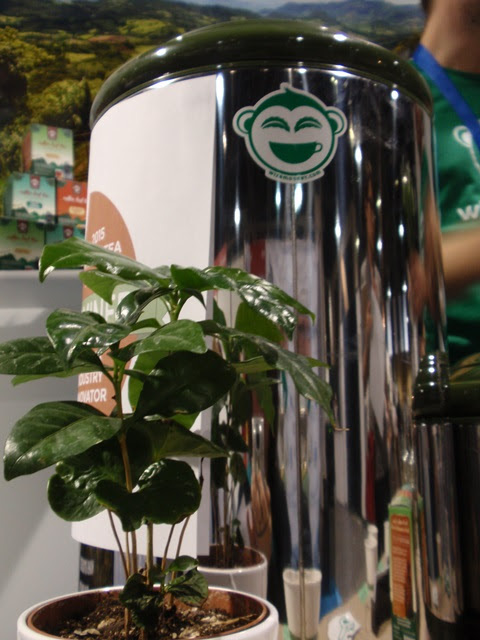 Laos Tea is producing hand-picked organic black (red), green, and puerh teas, hand-picked from 400 year old trees in a remote high elevation plantation in Phongsaly Province. I was impressed all around with their project, process, and product. 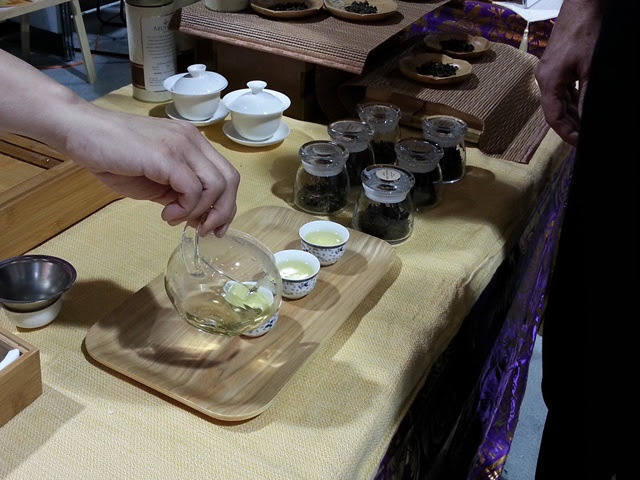 IDO introduced fermented herbal teas to the US market. The fermentation process retains medicinal properties while producing a mellower and more approachable result. While not intended as a casual beverage, the sample I tasted had a nice flavor and aroma. Wize Monkey introduced a new arabica coffee leaf tea (tisane) from an established organic coffee plantation in Matagalpa, Nicaragua. 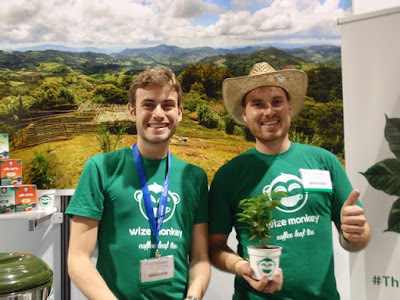 The tea producing plants are separate from the coffee producing plants, leaving coffee production unharmed while creating new jobs for the locals. I sampled Armando's Original which was pleasantly (and surprisingly) minty with a touch of effervescence. Thanks to Arnaud and Max for introducing me to something different and delicious! Shizuoka, Japan will host the 2016 World O-CHA Festival in Spring (May 13th - 15th, 2016) and in Autumn (October 27th - 30th, 2016). Their booth provided tips on preparing cold brew Japanese teas as well as demonstrating Sencha preparation methods. Indonesian organically certified tea producers, Arum Tea and Bukit Sari offered samples of cold brew tea as well as a gongfu preparation of a tea blended by the mother of our presenter, Melanie. 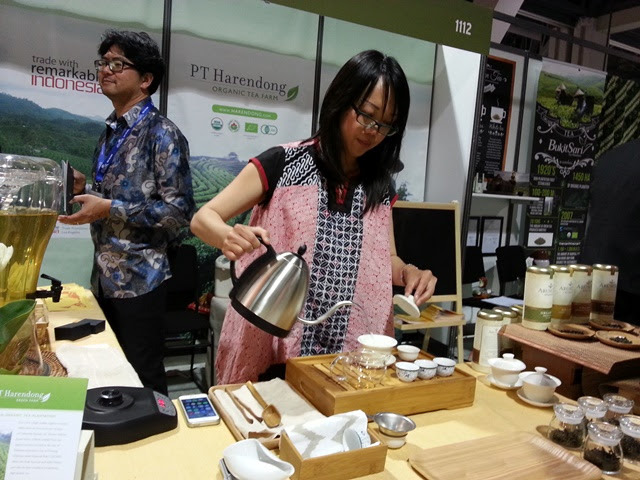 Among the top Day One trends were sustainability and organic production, cold brewing, and glass and BPA-free teaware. 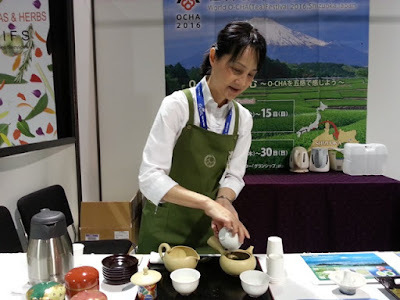 Zojirushi now offers a water boiler and warmer for commercial (5 liter) and home (4-5 liter) use with a quick temp setting to bring water up to a preset temperature without first heating to a boil. This quick temp setting is intended for use with spring or filtered water that does not require dechlorination. 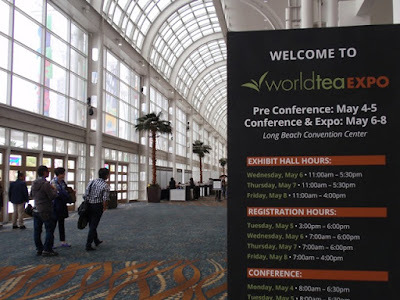 Bonavita offers a variable temperature kettle that has been popping up in tea rooms and tea shops around the Pacific NW, as well as at several vendor booths at the Expo. It has also been making appearances at specialty coffee barista competitions where speed and precision are key. 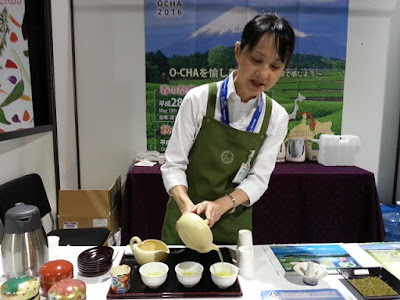 For Life, Takeya, The Tea Spot, and many other vendors are offering a broad range of attractive glass and BPA-free tea ware and dispensers. Results of a full day at World Tea Expo: Samples, samples and more samples! I have a lot of (delicious) work ahead!